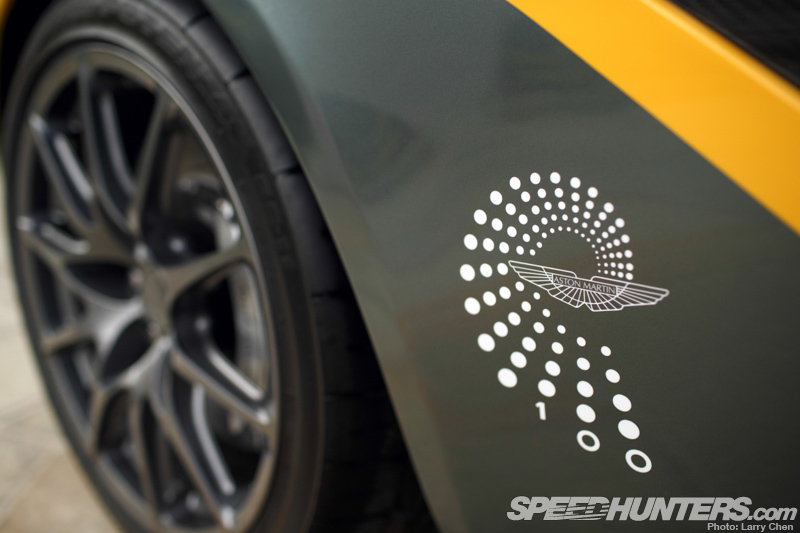 One hundred year anniversaries are a somewhat rare occurrence in the motoring world, so as part of Aston Martin’s centenary celebrations this year, the British car maker wasn’t going to let an opportunity to commemorate the occasion with a very special project pass it by. CC100 is the result. 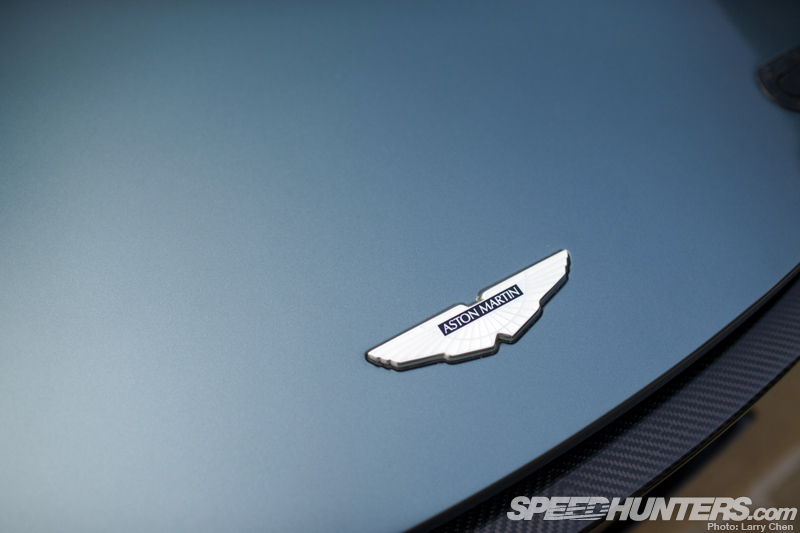 We first met the gorgeous speedster back in May, when Aston Martin’s CEO, Dr Ulrich Bez, unveiled the bespoke creation to the world, leading a parade lap around the Nürburgring Nordschleife ahead of the ADAC Zurich 24 Hours of Nürburgring race. 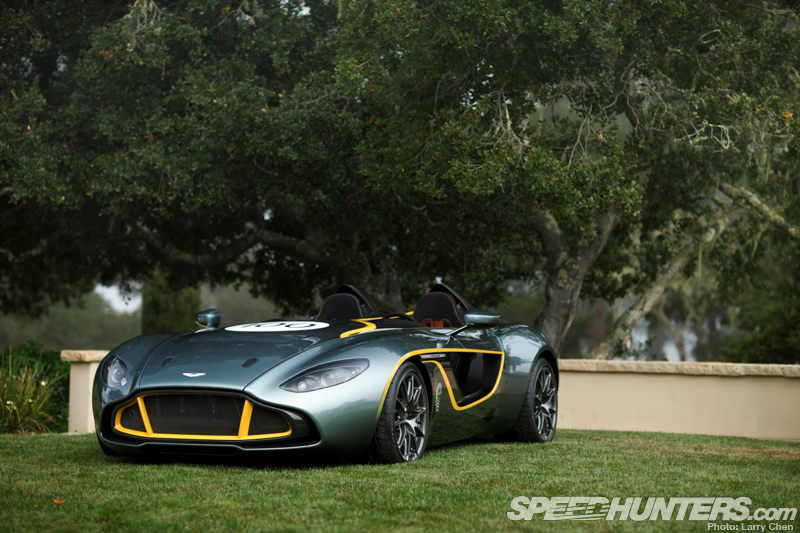 The contingent included Sir Stirling Moss, who was once again behind the wheel of the spectacular DBR1 – the famous racing model that won at Le Mans and Nürburgring in 1959, and 98 other Aston Martin machines of varying vintage. 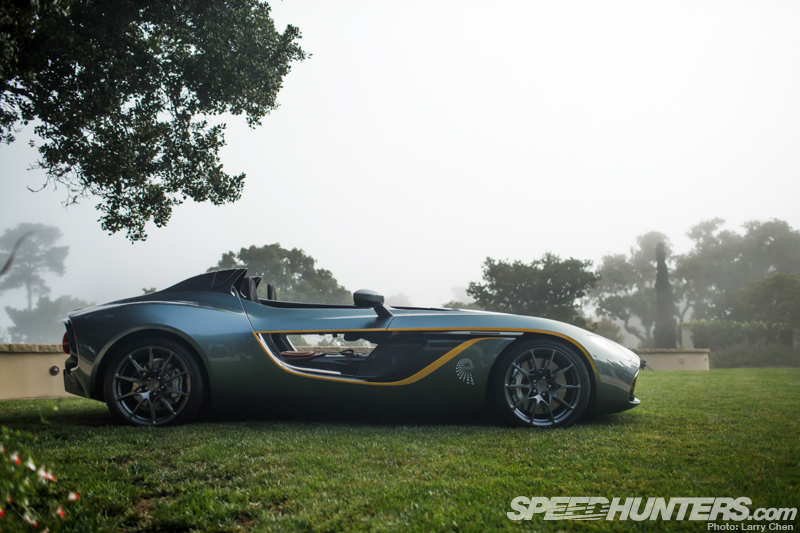 It’s easy to draw parallels between this car and the DBR1 with its open cockpit, unconstrained vision and seating just for two, but it’s wrong to think of the CC100 as a contemporary reimagination of a legendary racing machine. We’re looking at a glimpse of what’s to come for the inimitable marque. 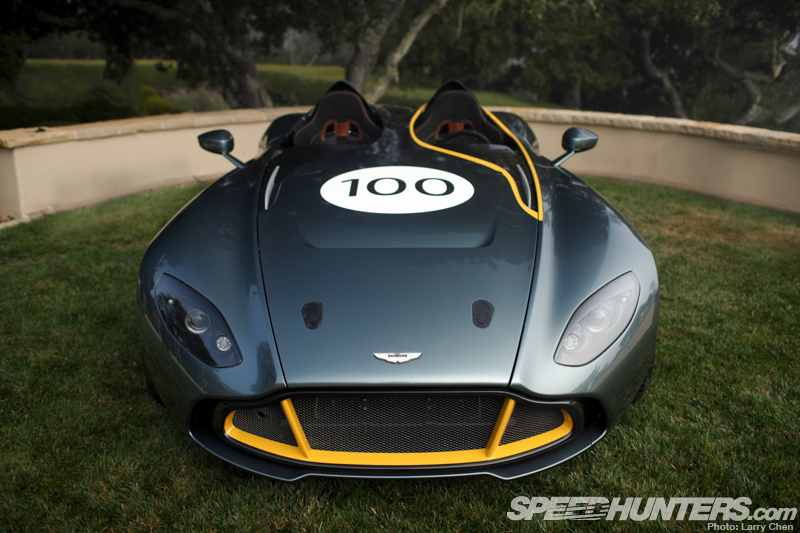 Originally the CC100 project was envisaged to be a one-off, but two cars were built and both examples have since been purchased by private buyers for undisclosed amounts. 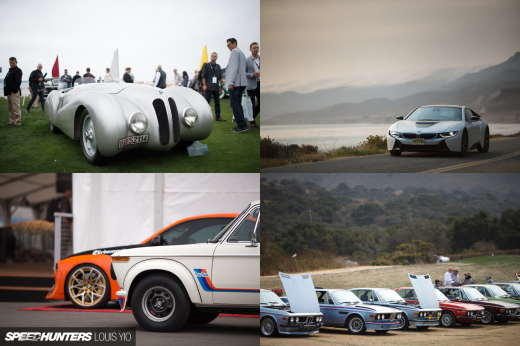 On his visit to Monterey and the Pebble Beach Concours d’Elegance last weekend, a very lucky Larry Chen got to spend some quality time with one of them. 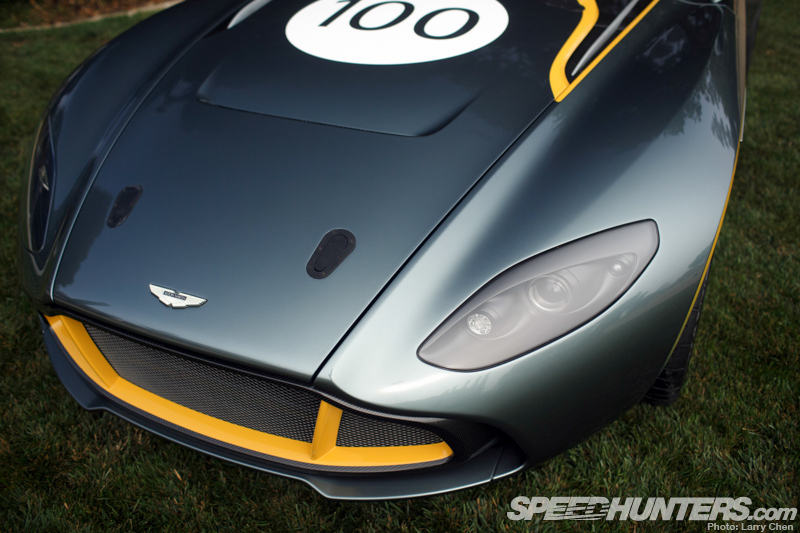 Unlike many future design studies that emerge from auto manufacturer design labs, Aston Martin’s DNA is unmistakable in the CC100. 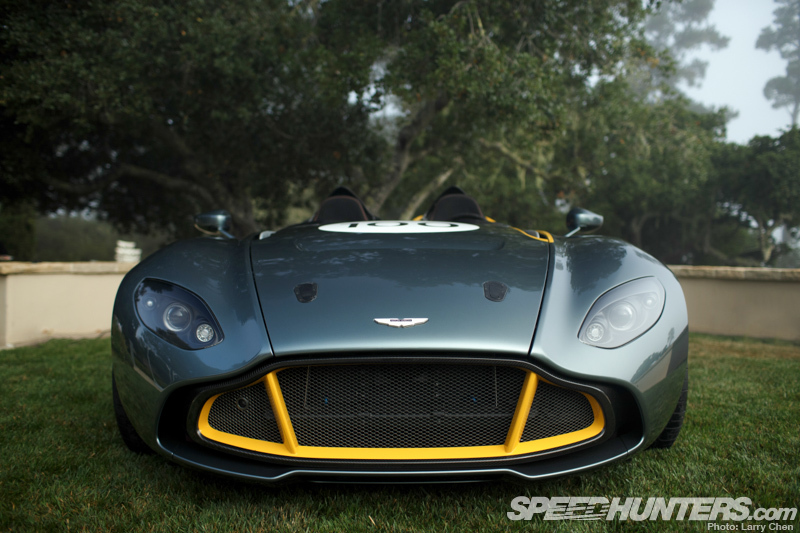 The project was given the green light in the latter half of 2012, leaving the automotive artisans in Aston Martin’s Prototype Operations department less than six months to design and build a car that perfectly reflected the brand’s first 100 years. No pressure then. Of course, that task would have been made much easier were the engineers only required a create static showpiece as is often the case with concept cars. But right from the get-go the brief called for a fully functioning vehicle, finished to the same exacting standards extended to all Aston Martin production cars. 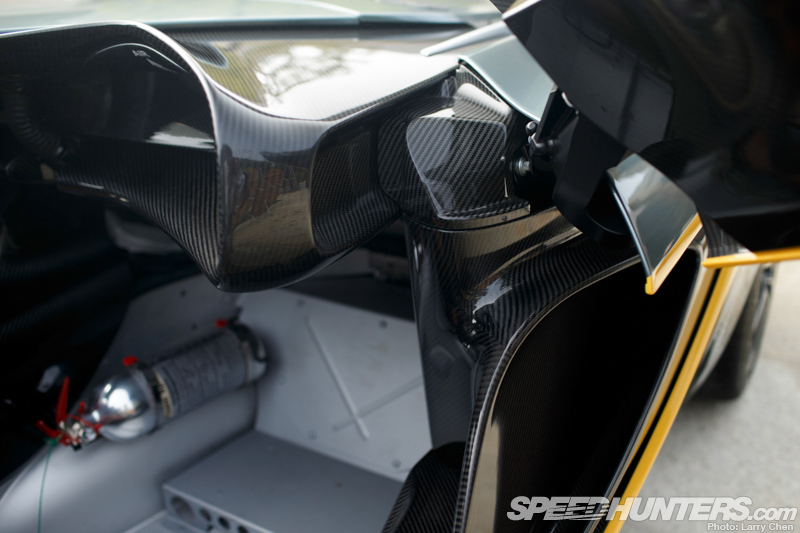 Realising an entirely new car from the ground up was not possible though, and given the parts bins at the team’s disposal there was absolutely no reason to try and reinvent the wheel anyway. 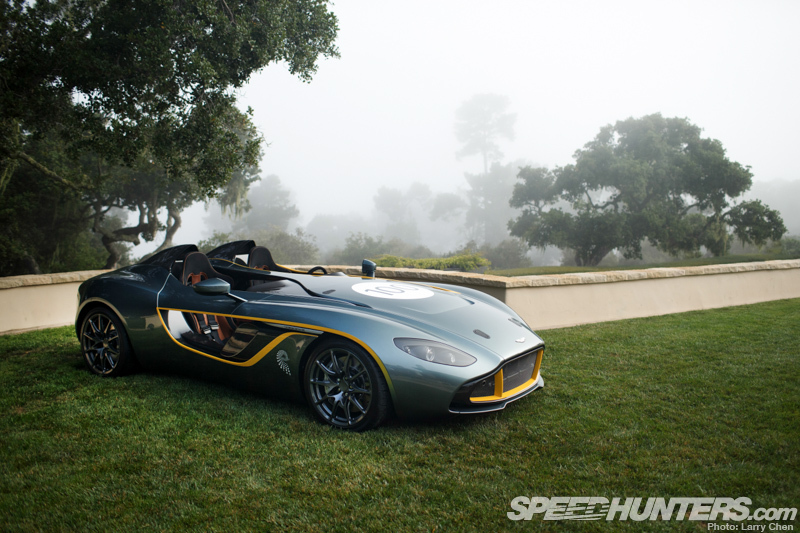 The highly versatile ‘VH’ (Vertical Horizontal) bonded aluminium chassis that underpins the limited edition V12 Vantage Roadster forms the backbone of the CC100. Dimensionally, its shares the same 2,600mm wheelbase and the same sills and the front bulkhead/firewall. But at well over two metres wide (including the mirrors), it’s considerably broader than the Roadster; a fact that necessitated control arms and a widened subframe at the front end, and longer driveshafts in the rear to collectively increase wheel track by 100mm (4 inches). The lack of height only accentuates its squat stance. The CC100’s bodywork however, is entirely unique to the project. Given the time restraints, at sketch level the exterior architecture was signed off swiftly, allowing Aston Martin’s Director of Design Marek Reichman, Chief Exterior Designer Miles Nurnberger, and their team to move quickly into the modeling phase. After working in scale a full-size clay model was carved and shaped by hand. 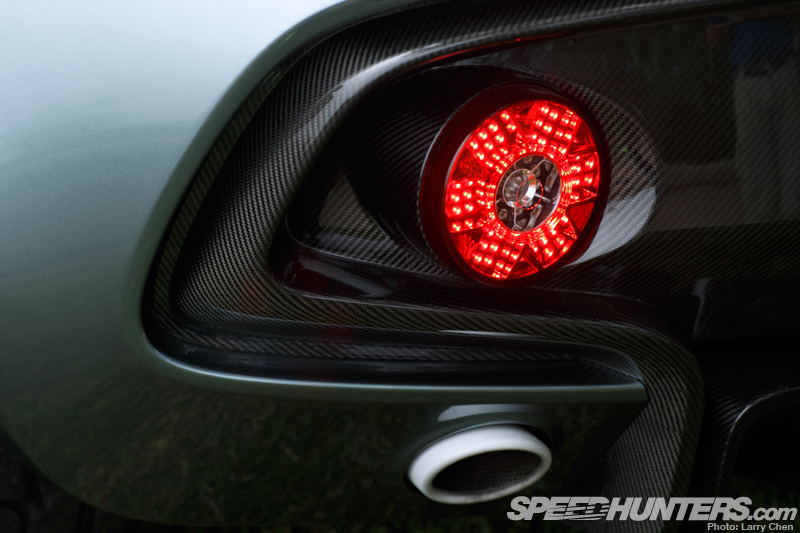 Then, the finished form was 3D scanned and digitally prototyped in-house, before being sent off to Multimatic – one of Aston Martin’s many technical partners – for precision molding in carbon fibre. 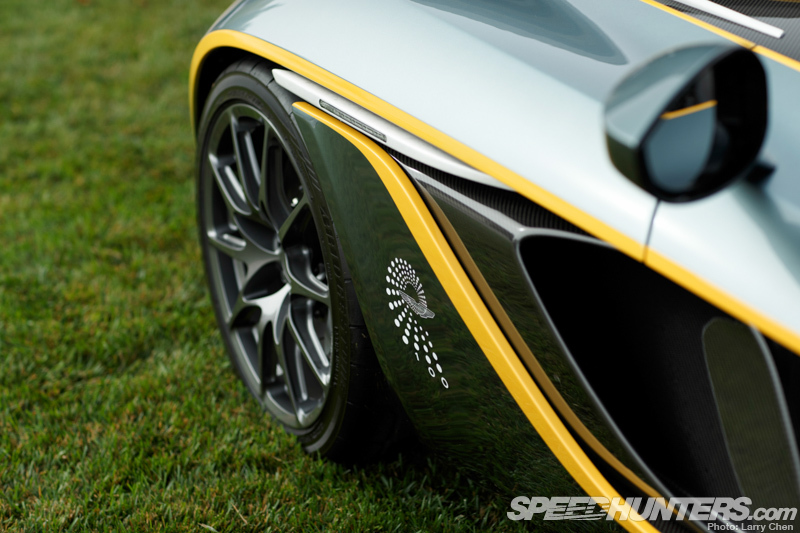 In total there are 55 separate carbon body panels draped over and around the alloy chassis, many with their raw weave exposed and finished in a high-gloss clear coat. 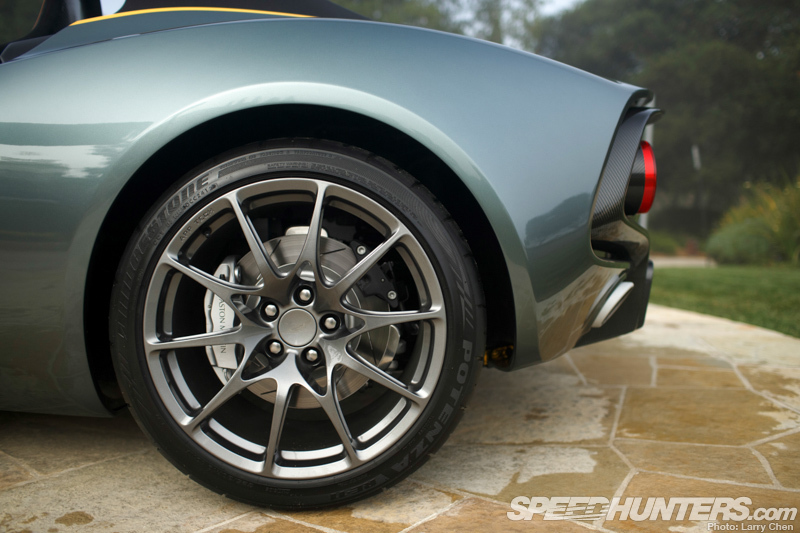 That means high tensile strength and light weight – 390kg (860lb) less than the V12 Vantage Roadster’s 1760kg kerb weight – if we’re crunching numbers. 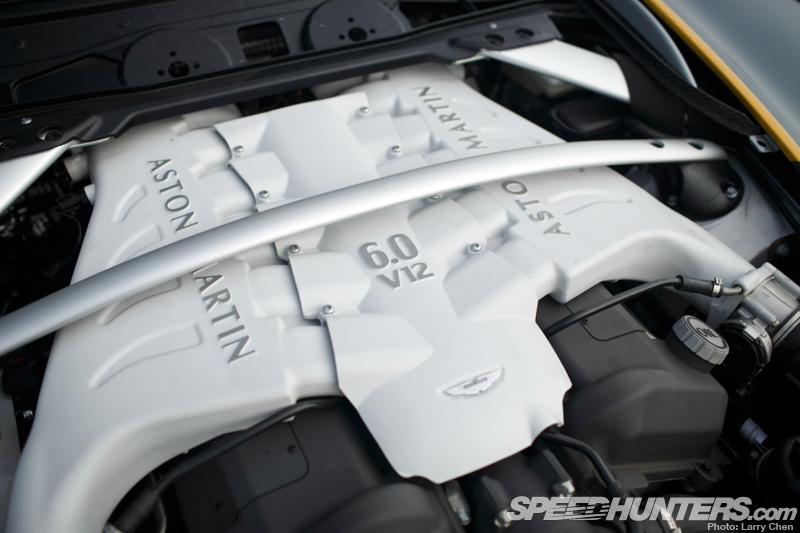 It’s not hard then to figure out what sort of performance is on offer with that latest iteration of Aston Martin’s venerable 5935cc V12 mounted low in the chassis up the front, just begging to be awaken. That masterpiece of naturally-aspirated engineering with its all-alloy construction, quad cams and 48 valves delivers 565hp at 6,750rpm, and 620Nm (457lb/ft) at 5,500rpm through a finely-tuned Bosch Motorsport engine management system. 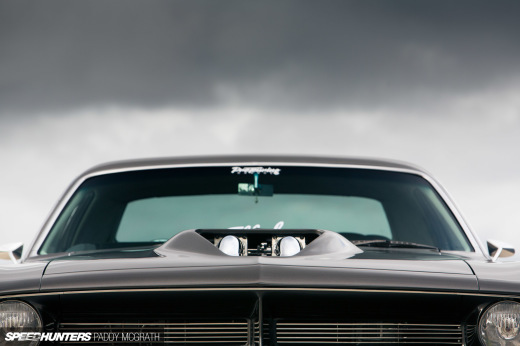 Five hundred and sixty five horsepower – thirteen hundred and seventy kilograms: it’s a pretty healthy ratio. 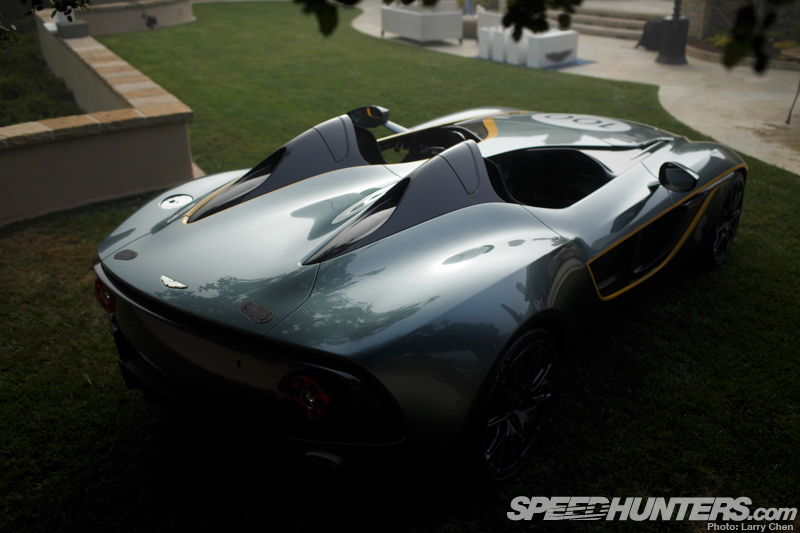 Aston Martin says the CC100 can go zero to 62mph (100km/h) in a little over four seconds, before storming its way to an electronically-governed top end speed of 180mph (290km/h). 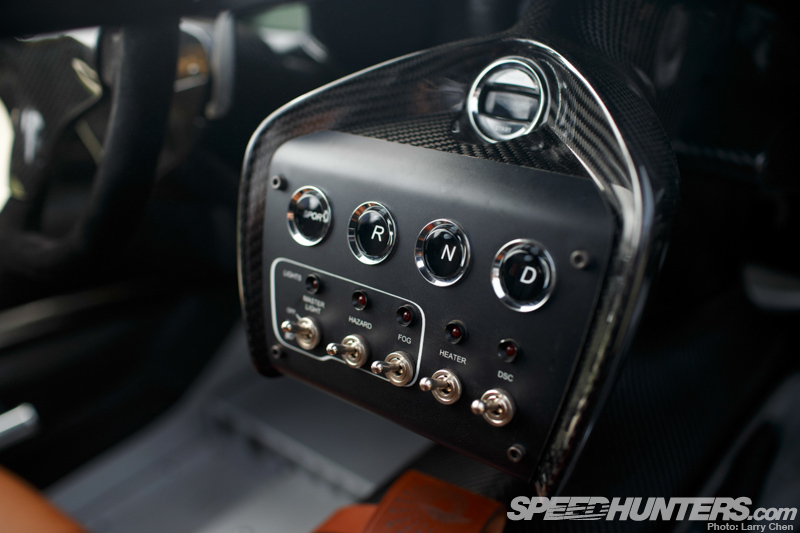 Helping it achieve those numbers is a six-speed, hydraulically-actuated, automated sequential manual transmission from Italian maker Oerlikon Graziano. 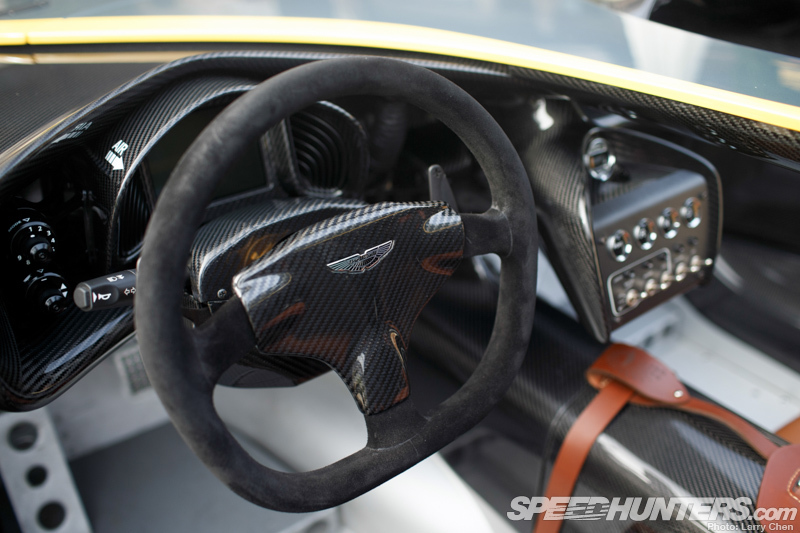 Unlike the V12 Vantage Roadster, which is only available with a traditional manual gearbox and a floor stick; in the CC100 clutch-less gear changes are made via the steering column-mounted paddle shifters. 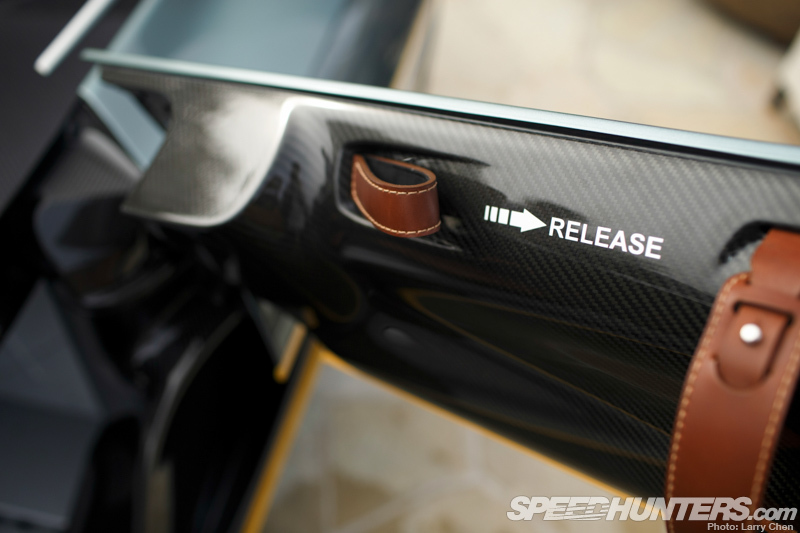 The chassis and handling tune needs a mention here too, because unlike Aston Martin’s road car range, which across the board offers up a perfect balance between performance and comfort – as all grand tourers should, the CC100’s suspension specification has been developed directly from the car maker’s GT4-spec Vantage race car programme. That goes some way in explaining the four-way adjustable dampers at each corner, along with bespoke 18-inch forged alloys from Italian wheel boutique APP Tech and brakes by Brembo. It is, for me at least, the way the CC100 presents itself that is the defining factor here. 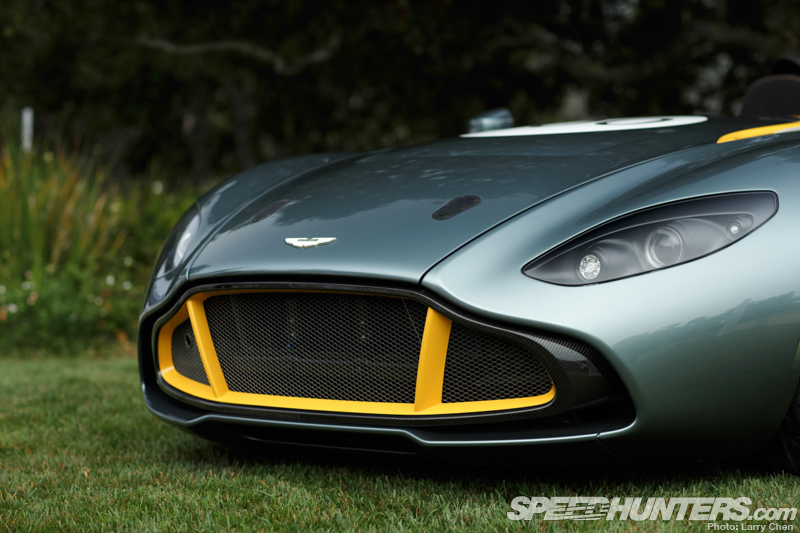 From the expansive One 77-esque front grille treatment to its Aston Martin Heritage Racing Green paintwork and yellow ‘lipstick’ accents, Aston Martin has hit the mark. To be honest, I’m not sure there’s a bad angle to view the car from either. It’s often said that beauty is in the details, and that’s certainly true of the CC100. 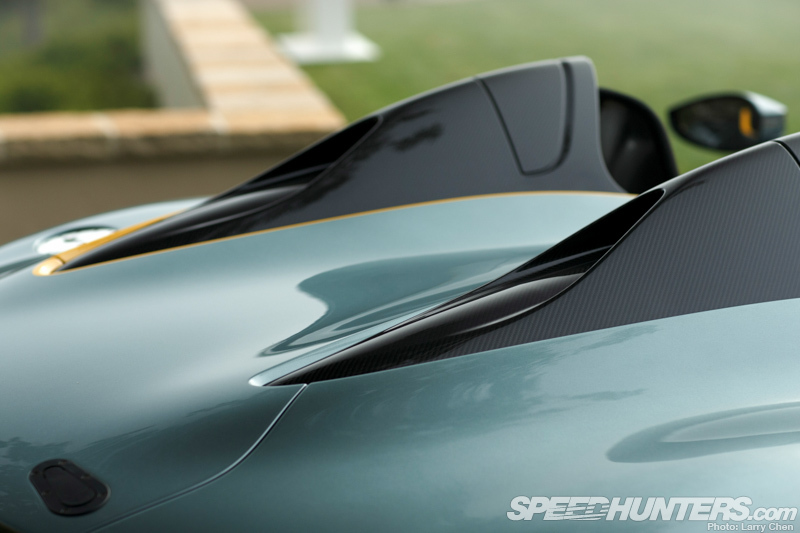 The two fins that rise up from the bodywork behind the driver and passenger compartments serve a purpose without distracting from the car’s dramatic, yet elegant lines. From an aesthetic perspective there was no place in the CC100 for small rectangular doors. The solution? Narrow, gull-style wings built around solid intrusion beams that allow easy access to and from the cockpit when opened outwards. 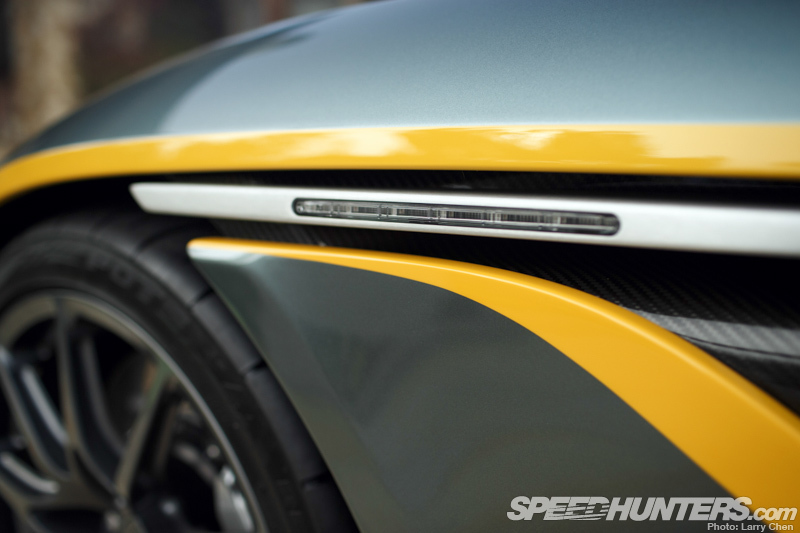 Then, when they’re closed, they almost blend into the large front fender panels. The resulting open voids on the flanks enhance the ‘open cockpit’ philosophy with a new perspective on the road that I imagine is best served at speed. 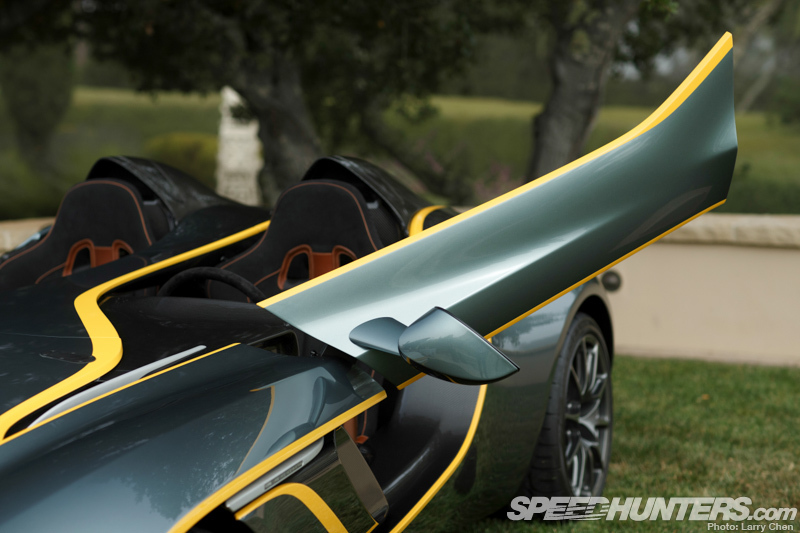 I really like how the yellow detailing around the driver and passenger entry and exit points each have a subtle tie-in to one half of Aston Martin’s winged motif too. See what I mean? It’s all in the details. There was clear directive when it came into the interior space. There’s a race car script here, but absolutely no compromises on fit or finish. 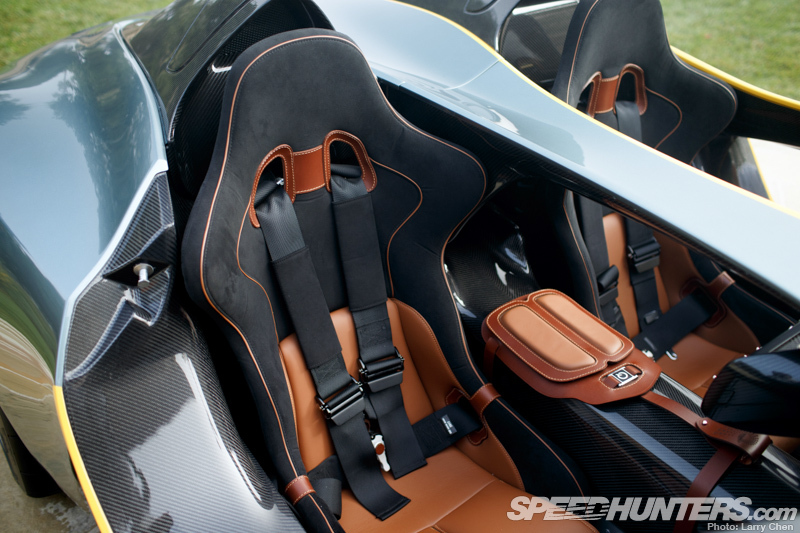 Sparco, for instance, supplied the seats, but Aston Martin chose black Alcantara along with soft leathers from Scottish tannery Bridge of Weir to take them to an all-new quality level. 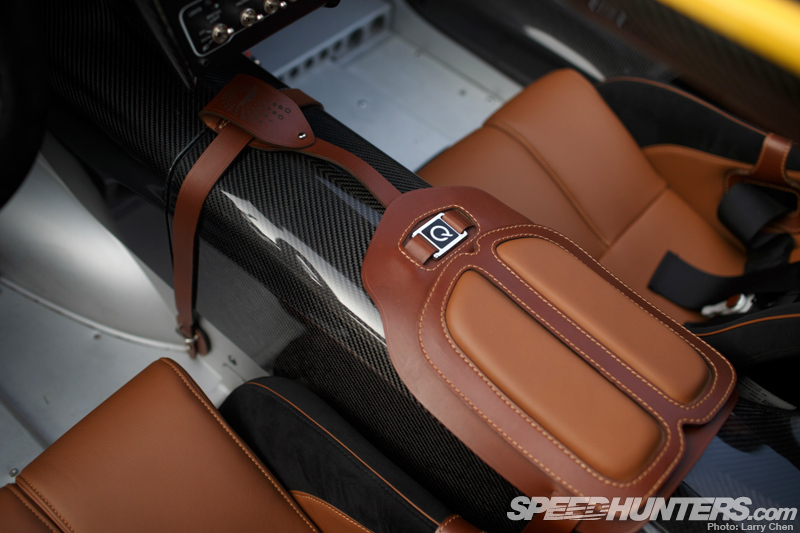 Have carbon fibre paneling and hand-crafted leather accessories ever gone so well together? I don’t think so. 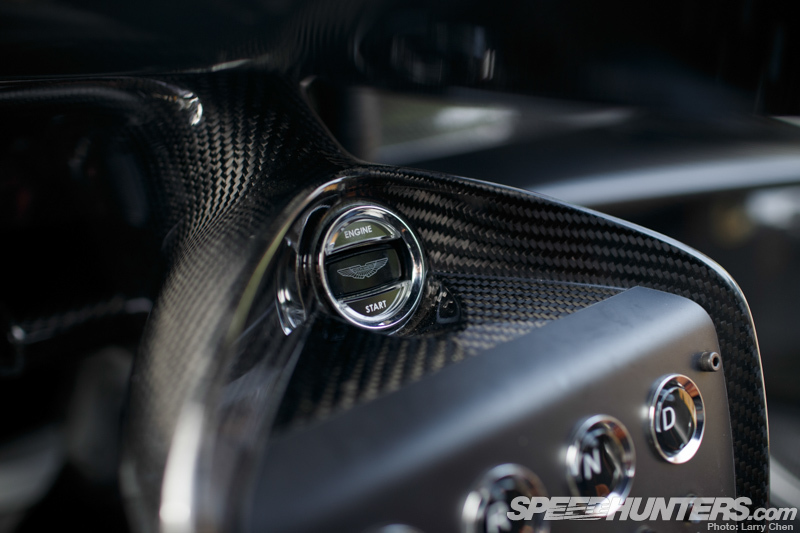 The steering wheel is another item from Sparco’s competition catalogue, but it too has been dressed up for the occasion with more of the good stuff from Multimatic. 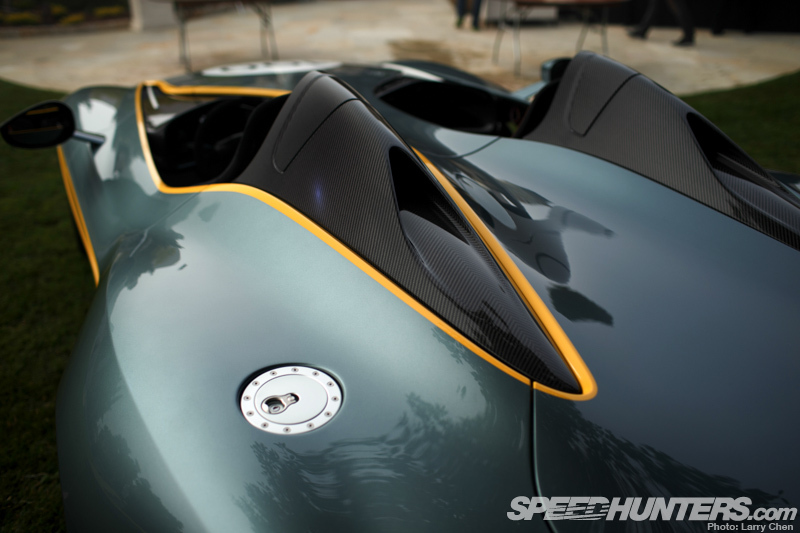 The slim dashboard – also exquisitely cast from carbon fibre – is another throwback to DBR1 design. The ‘Q’ touch from Aston Martin’s personalised design service speaks volumes of the high-end fit out the CC100 has received. Who wouldn’t want to rest their elbows right there? 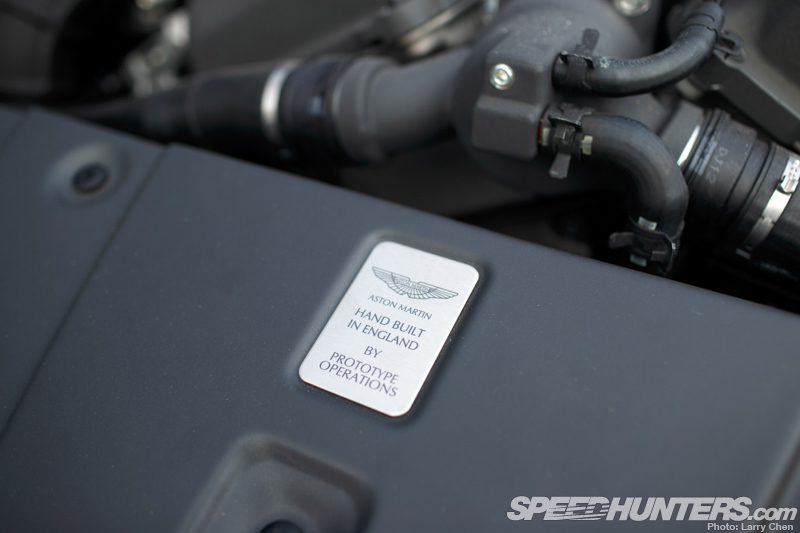 Wherever you look, it’s that sort of attention to detail that Aston Martin has built its name on. 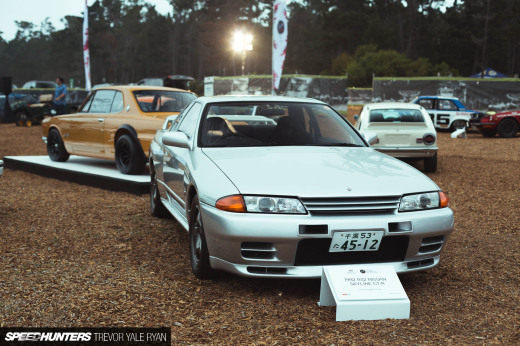 Since the car hasn’t been homologated, technically speaking, it can’t be driven on the road. No problem for the long, smooth driveway that winds its way through your impeccably-manicured lawn to the manor’s front door of course, nor the race track where the CC100 was really designed to be driven. It has all the right working bits though, so low volume compliance is highly possible. Not a legal requirement of course, but there’s even a heater to keep your toes warm. The roof certainly isn’t much help in that department. 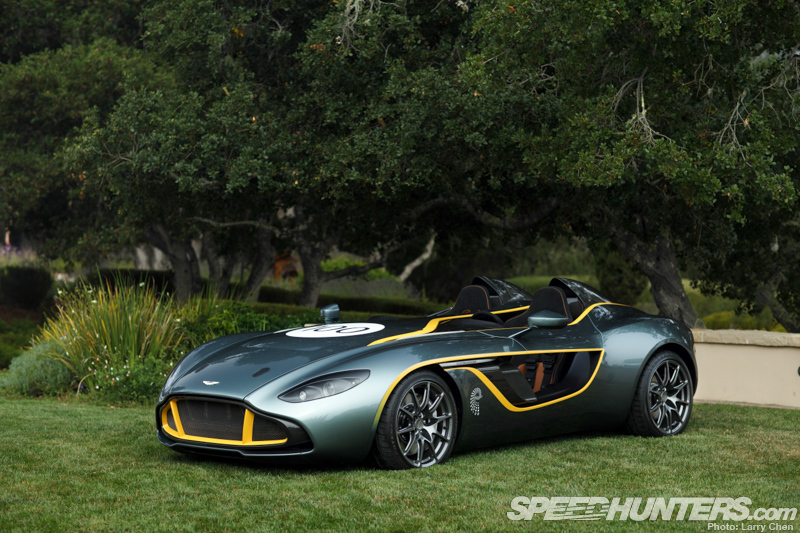 I think it’s safe to say that Aston Martin has truly captured the spirit of the brand in this amazing creation. The CC100 is a finely-honed machine that tips its hat to the past, but at the same time has its eyes firmly set on the future. 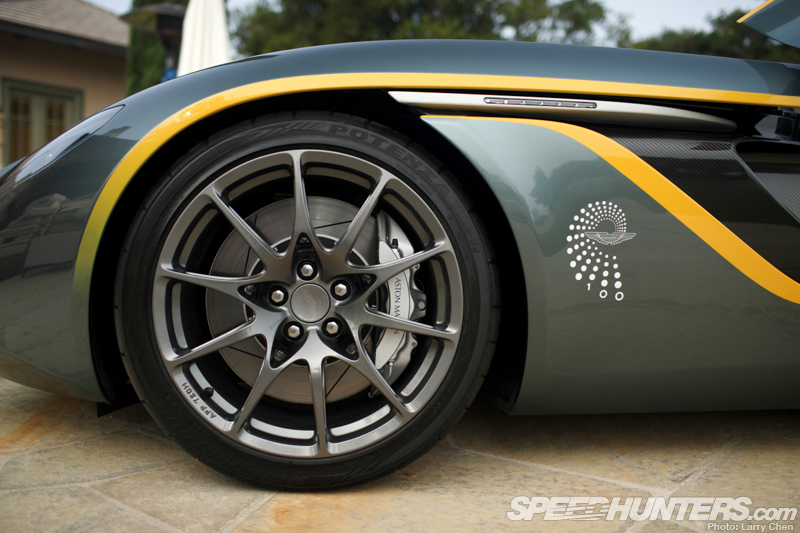 If it’s anything to go by, there’s exciting times ahead for Aston Martin. Why aren't any of the pictures available as a desktop background anymore?